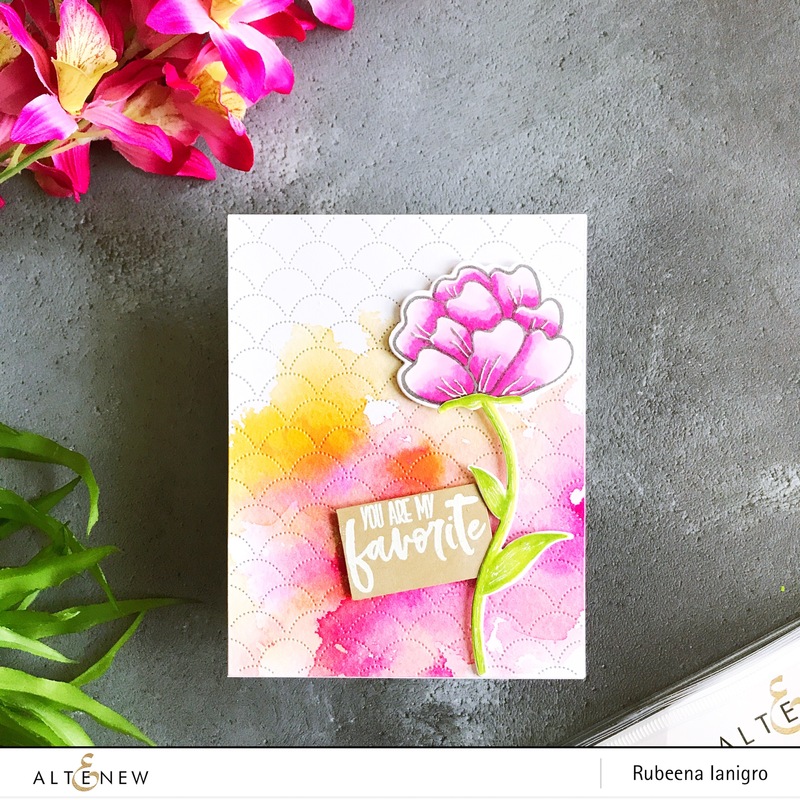 Hello, Altenew fans. 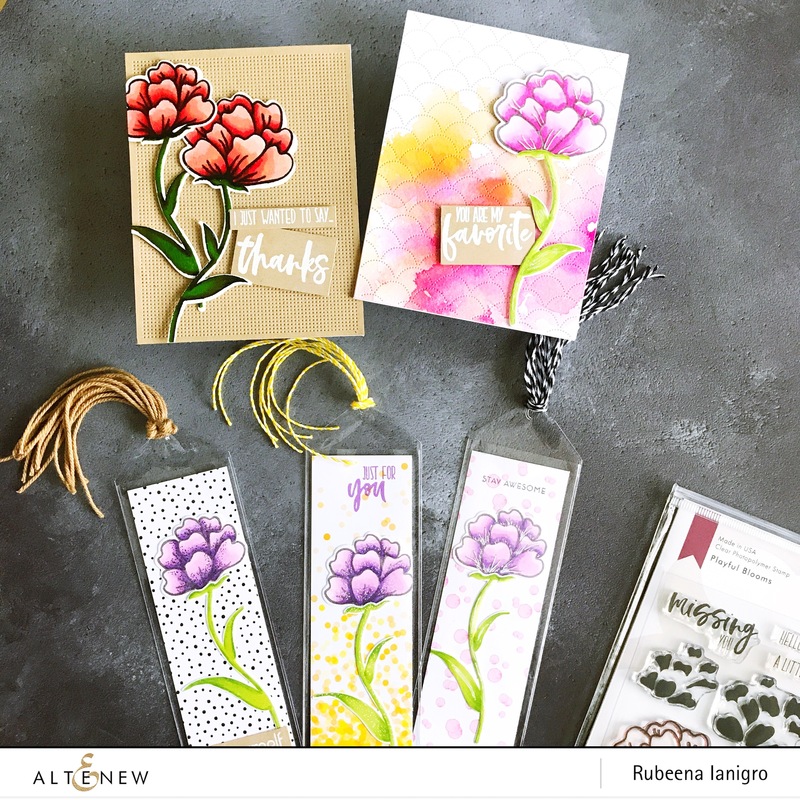 Rubeena here with a Stamp Focus post on the newly released Playful Blooms Stamp Set with the coordinating dies. I also used some paper from the Celebrations Paper Set from the Celebrate You Kit. 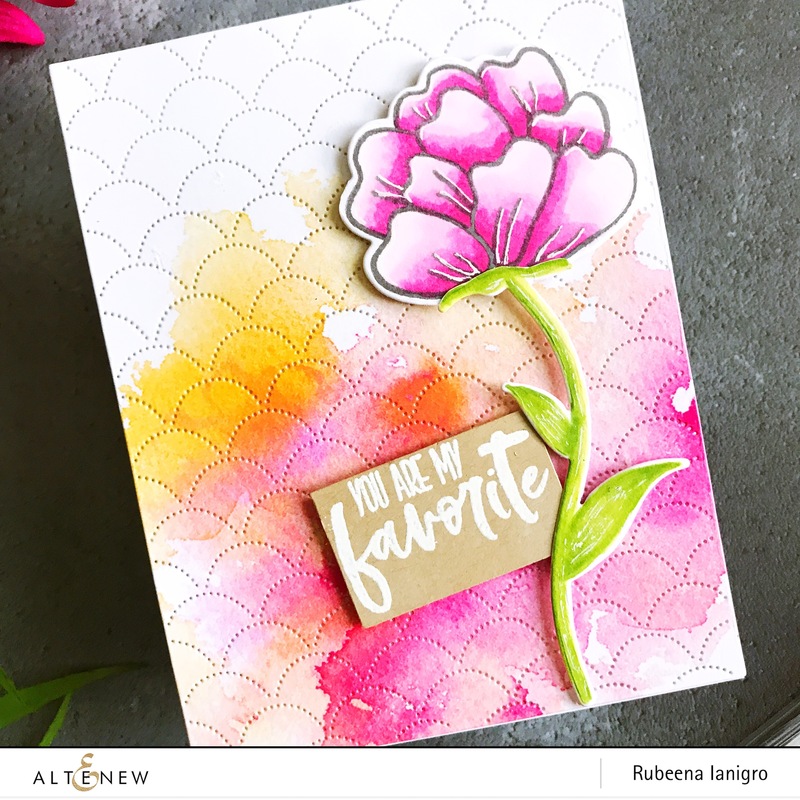 For my first card, I stamped the larger bloom on white cardstock using a dark grey ink pad. I stamped the stem in Frayed Leaf. I colored both stamped images with alcohol ink markers. The stem is a solid image, which is why I stamped it in a very light color so I can color over it with markers. I added some white gel pen details to the petals. For the background, I trimmed down a sheet of paper from the Celebrations Paper Set to 4.25″ x 5.5″ and then die-cut it with the Dotted Scales Debossing Cover Die, which is basically my favorite cover die ever! I glued it to my folded card base and then mounted the bloom and stem over it with foam tape. 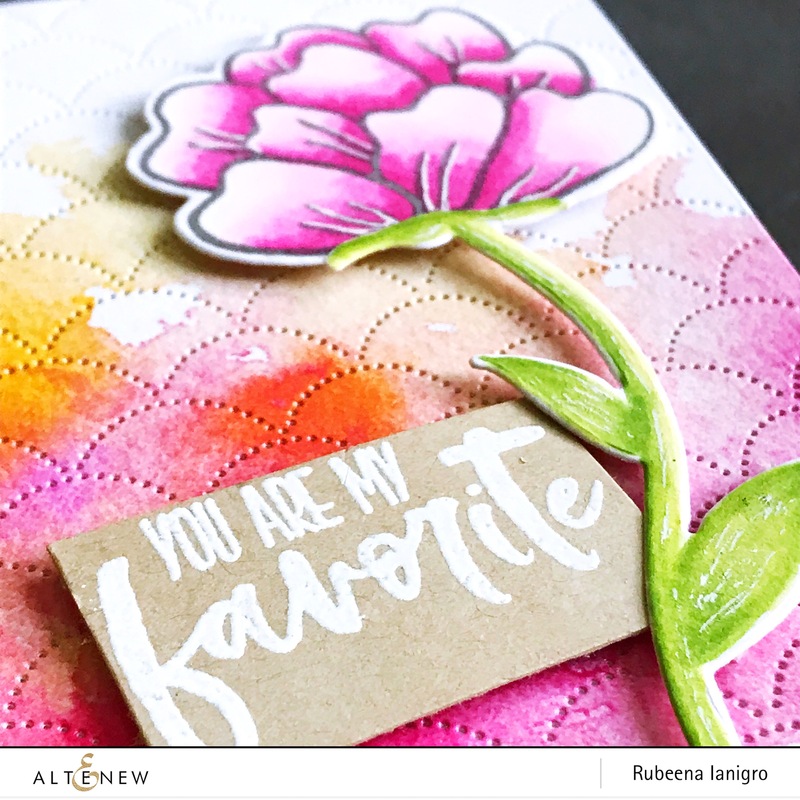 For the sentiment, I stamped “you are my favorite” from the Playful Blooms Stamp Set on Kraft cardstock and heat-embossed it with white embossing powder. I trimmed it down to a rectangle and mounted it right against the bloom. For the next card, I used a darker color palette and different medium: watercolor brush markers. First, I die-cut the large die from watercolor paper before stamping the images on it. I used Jet Black and Frayed Leaf for the stamping. I watercolored the images with brush markers. For the base, I used the Cross Stitch Canvas Die and die-cut it from Kraft cardstock. I adhered it to my folded card base. Then I heat-embossed sentiments from Playful Blooms and mounted them, along with the flowers, over the base. Finally, for the bookmarks, I trimmed down three sheets from the Celebrations Paper Set to 2″ x 6″ so they would fit inside the vinyl holders I had. 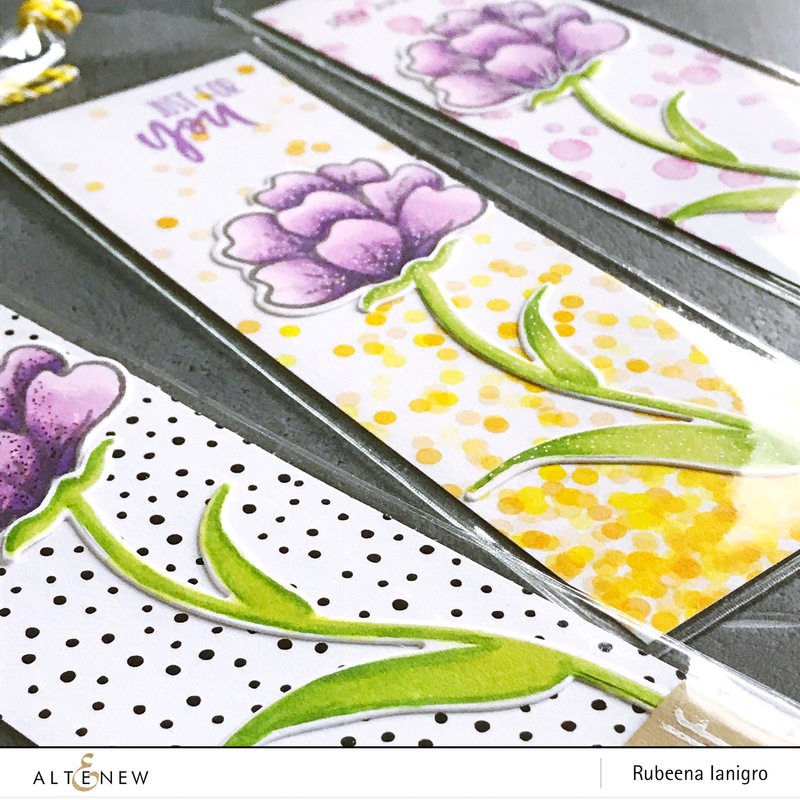 Next, I stamped three smaller blooms and coordinating stems onto white cardstock and then colored them using alcohol ink markers. I adhered them to the trimmed patterned papers with liquid adhesive so they would be flat. I added some details with a white and black pen just to give it different looks. 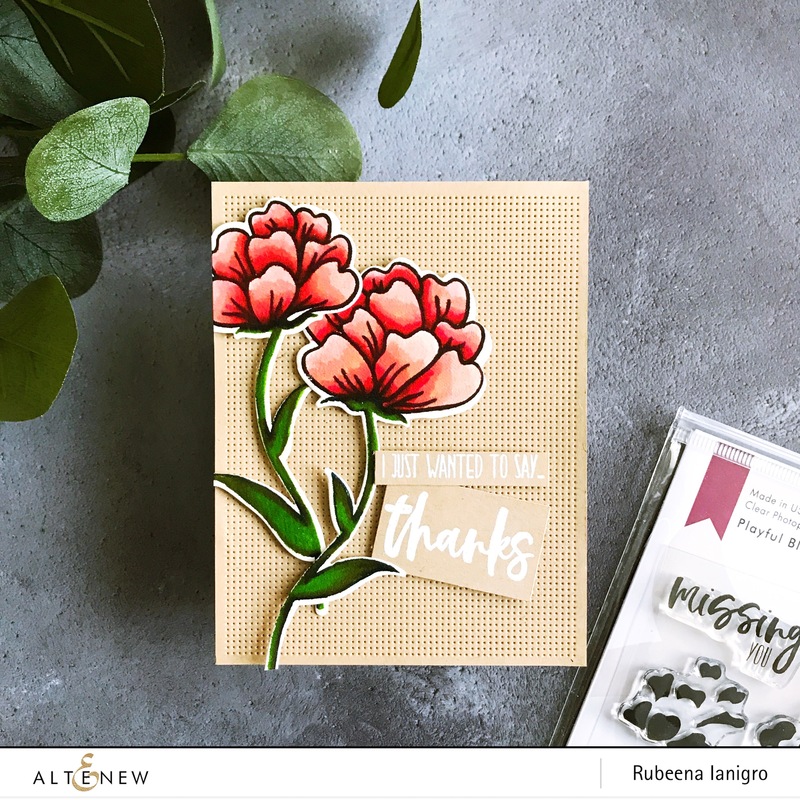 The sentiments are from Playful Blooms, Dainty Swiss Dots Stamp Set, and Needlework Motif. Finally, I added some twine to the bookmark holders. I hope you were inspired to use these sets in new ways. Thanks so much for visiting today! You do the most beautiful watercoloring and marker coloring. These are all so gorgeous!!! 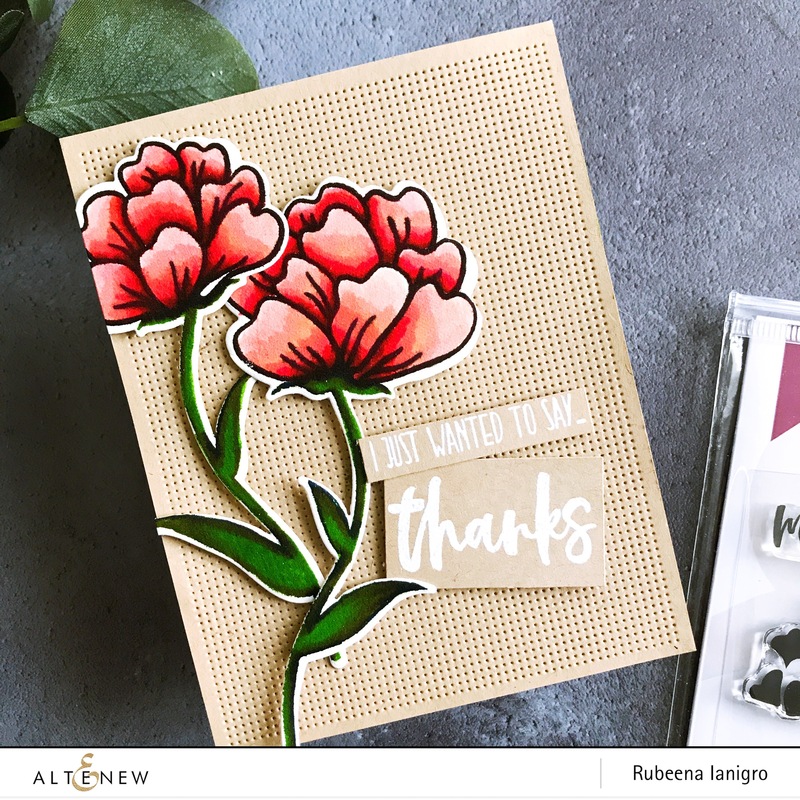 I love the card you created using the “Dotted Scales” cover die, its one of my favourite as well. 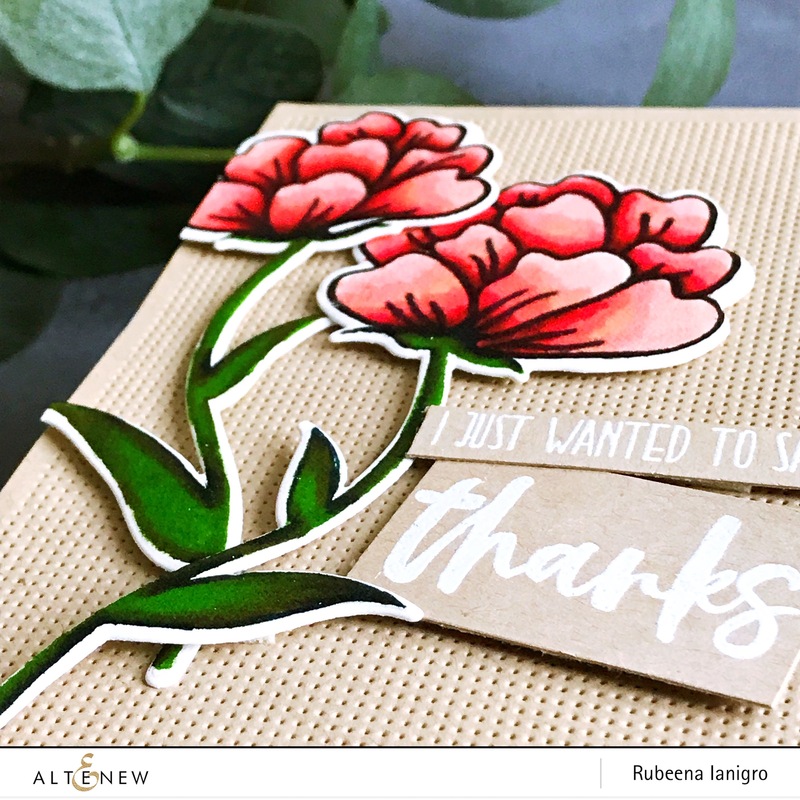 The “Playful Blooms” is such a beautiful new stamp set, I can’t wait for mine to arrive. All of your colouring in the 3 different mediums medium is amazing! 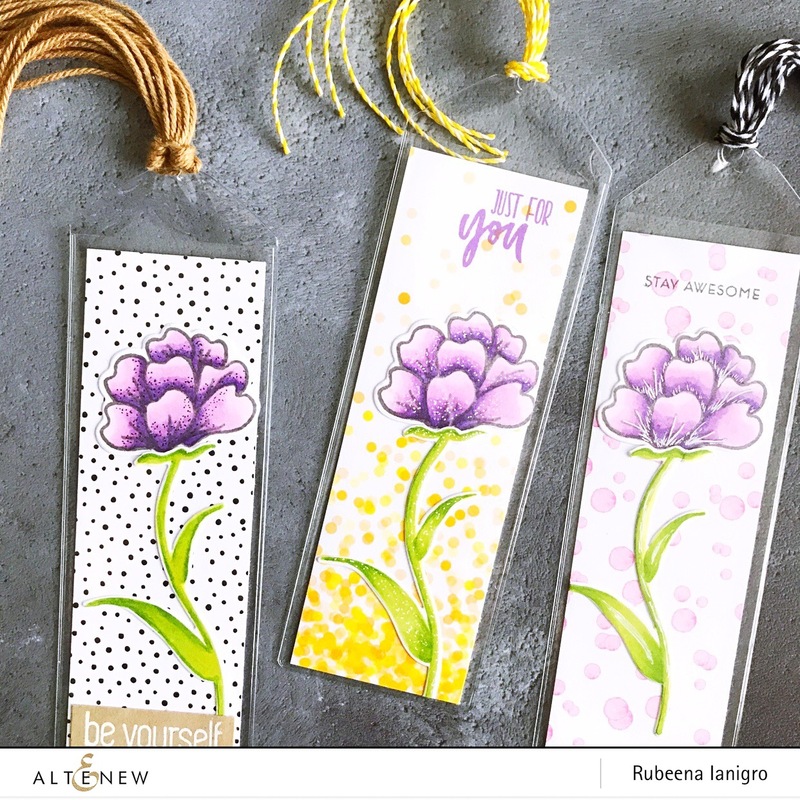 Pretty cards and bookmarks, love your coloring and seeing the same stamped image in dark gray and black. Where to you get the vinyl covers for the book marks?? 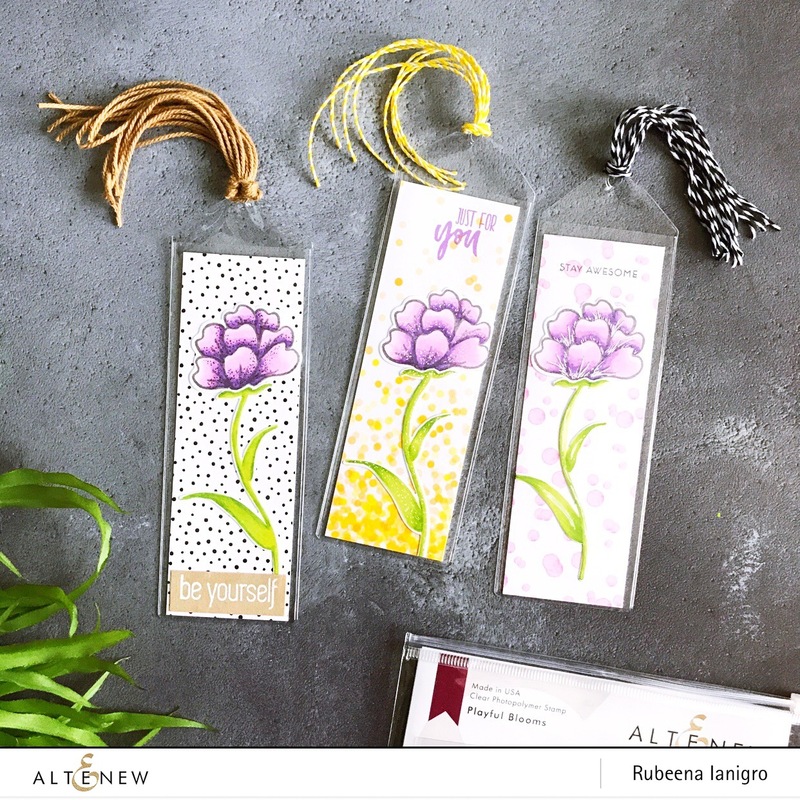 I am curious too about the bookmark holders. Love! I like them all! I have the cross stitch one… gave me ideas… also love the purple book marks!